Kitchen and bathroom sinks and lavs are among the most utilitarian of all the fixtures in a home. Perhaps the hardest working is the kitchen sink, which is typically used at least an hour per day and can be subject to quite a pounding. Bathroom sinks are almost as busy though they generally don’t undergo the same amount of wear and tear. Because both are central to the functions of their respective rooms, their appearances are important to the rooms’ style. With this in mind, it pays to choose well when selecting sinks and lavs, and to keep them in top shape. The standard kitchen sink is 22 by 30 inches, with two equal-size bowls that are 8 inches deep. But specialty sinks can cater to your preferences. There are sinks with 9- or 10-inch-deep bowls if you frequently use large pots, high-set shallow bowls that go between the two basins for peeling and washing vegetables, oversize single basins, unequally sized basins, and basins that fit into tight corners. 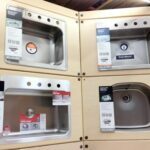 The Kitchen Sinks Buying Guide will tell you all you need to know about your options so you can make an informed choice. As the number and type of bathrooms in the average home have expanded, so has the selection of bathroom sinks, which now range from tiny wall-hung versions for the smallest of powder rooms to elaborate dual-basin models for luxurious master baths. In between are deck-mounted models, pedestals, consoles, and more. Materials range from enameled cast iron to vitreous china, as well as metal, glass, stone—almost anything that can hold water. 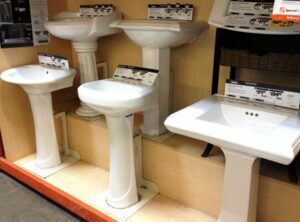 The Bathroom & Lavatory Sinks Buying Guide presents all your choices. In Sink & Drain Plumbing, we explain the inner workings of both kitchen and bath sinks, and related articles include how a garbage disposer is incorporated into a kitchen sink drain and how a pop-up drain stopper works in a bathroom sink. Detailed diagrams provide a visual tour of both types of sinks’ parts and how they function together. By far the most common problem the sink plumbing system experiences is a clogged drain. In Sink & Drain Repairs and its related articles, we provide illustrated, step-by-step instructions on how to snake, plunge, and water blast a drain. Other helpful tips include how to rid a sink of foul odors, how to repair a sink trap, and how to fix a pop-up stopper. Installing a sink is something even a moderately skilled do-it-yourselfer can accomplish with proper planning and preparation. In How to Install a Kitchen Sink, we take you through illustrated steps for installing a countertop sink in a new location. And, in How to Install a Bathroom Sink, we show you how to install a range of sink types, from pedestal to wall-mounted, above-counter to undermount, all with illustrated step-by-step instructions.